LIVE OCTOBER 19, 20, & 21 2017, IN PHOENIX, ARIZONA! Buy 1 ticket and bring a guest FREE! 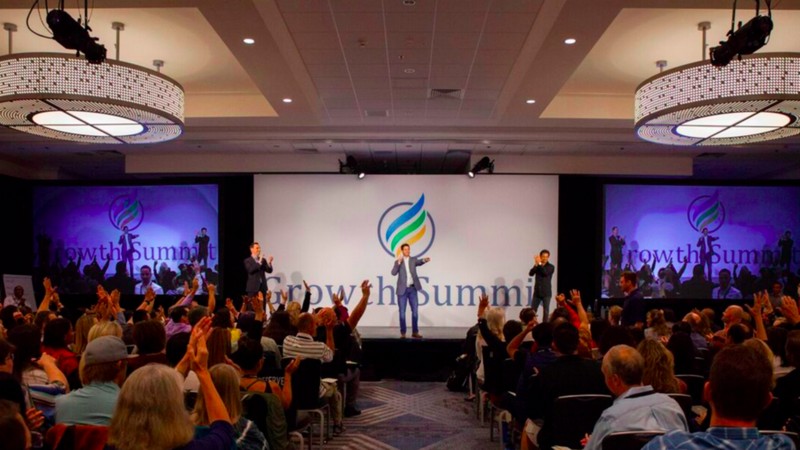 During these three days, you're going to learn all the secrets and best-practices from the world's most best experts in their fields in Mindset, Health, Success, and Relationships. This will be one of the most transformative events of your life! Be ready to accelerate your growth to the next level by learning strategies from experts like Larry King, Trent Shelton, & Brendon Burchard and more. I have read and agree to the Growth.com terms, conditions, and event terms. YES, I understand that registration is first-come, first-served, so it’s possible that all seats will be taken if I don’t register today. This $297 registration and materials fee is non-refundable and non-transferrable, regardless of circumstance. YES, I understand I can register one (1) guest to attend with me for FREE. Please note you will be emailed separate instructions to register your guest upon completing this checkout. YES, I understand that I cannot transfer my tickets to a later GROWTH SUMMIT event- my registration is ONLY good for the event date listed on this page. YES, I understand I’ll be sent hotel and logistics information after I register. Please carefully read the following terms and conditions relating to your participation in Growth Summit 2017 (the "Seminar") which is conducted by Growth Academy, LLC ("Promoter"). By registering for the Seminar at any one of our locations ("Hotel"), you (the "Attendee") signify your acceptance of and obligation to these terms and conditions. If you have objections to the following Terms and Conditions, you should not register for or attend the Seminar. Promoter requires all Attendees to be respectful and professional to our staff, location hosts, speakers, and other attendees and their guests or families throughout the Seminar, even during non-scheduled downtime and breaks. Promoter reserves the right to ask Attendee and/or their guests to leave the conference room and Hotel immediately should they be deemed rude, uncooperative, unprofessional, intoxicated, or in possession of alcohol or any illegal substance. In such case, the Attendee's tuition/fees for the Seminar will not be reimbursed under any circumstances and they will not receive any future products, services, or correspondence from Promoter. Attendee will also not receive any of our advertised bonuses or qualify for our satisfaction guarantee or any other written or implied guarantee. I, the willing Attendee of the Seminar, hereby accept all risk to my health and of my injury or death that may result from participating in the Seminar and I hereby release Promoter and their officers, employees, interns, contractors, sponsors, and representatives from any and all liability to me, my personal representatives, estate, heirs, next of kin, and assigns for any and all claims and causes of action for loss of or damage to my property and for any and all illness or injury to my person, including my death, that may result from or occur during my participation at the Seminar, whether caused by negligence of the Promoter, its governing board, officers, employees, or representatives, or otherwise. I further agree to indemnify and hold harmless Promoter and any third-party company from liability for the injury or death of any person(s) and damage to property that may result from my negligent or intentional act or omission while attending and participating in the Seminar. Under no circumstances will Promoter or their assigns be held liable for my injury or death or any loss or damage of my personal belongings resulting from my participation in the Seminar. Should I require emergency medical treatment as a result of accident or illness arising during my attendance and participation in the Seminar, I consent to such treatment. I acknowledge and I agree to be financially responsible for any medical or legal bills that may be incurred as a result of emergency medical treatment. I will notify Promoter verbally and in writing if I am at any time injured prior to, during, or after the Seminar in my travels or attendance, or if I have medical conditions about which emergency medical personnel should be informed; however, I understand that Promoter is not legally obligated to act on that information in any way or to providing any medical service whatsoever to me. I agree that if I have any medical or psychological conditions that may hamper me from fully and healthfully participating in the Seminar that I will notify the Promoter and that the Promoter retains the right to ask that I not participate in portions of or the entirety of the Seminar. The information contained in or made available by the Promoter or any third-party through the Seminar or their websites or services cannot replace or substitute for the services of trained professionals in any field, including, but not limited to, mental, financial, medical, psychological, or legal fields. Promoter does not offer any professional personal, medical, financial, or legal advice and none of the information contained in the Seminar should be confused as such advice. Neither Promoter nor their assigns, sponsors, speakers, partners, contractors, or any of their affiliates will be liable for any direct, indirect, consequential, special, exemplary, or other damages to the Attendee or the Attendee's business, including economic loss, that may result from participation in the Seminar or from the use of, or the inability to use, the materials, information, or strategies communicated through the Seminar or any products or services provided pursuant to the Seminar, even if advised of the possibility of such damages. Under no circumstances, including but not limited to negligence, will Promoter be liable for any special or consequential damages that result from Attendee's participation in the Seminar. To be clear: You, the Attendee, alone are responsible and accountable for your decisions, actions, and results in life, and by your participation in our Seminar, you agree not to attempt to hold us, the Promoter liable for any decisions, actions, or results that you make or experience in business or in life due to your participation in this Seminar at any time, under any circumstance. Attendee hereby understands that the tools, processes, strategies, materials, and information presented in the Seminar are confidential, copyrighted, and proprietary to the Promoter and agrees not to record, duplicate, distribute, report on, teach or train from the Seminar materials in any manner whatsoever without the express written permission of Promoter. Attendees may not use any device to video, photograph, or record any aspect of the Seminar. Attendees who do not abide by this policy will be asked to destroy any recorded materials and may be asked to leave the Seminar and will not be eligible for a refund. Attendees may not report on any of the concepts taught at the event, including providing a summary or review of the event on/in any media outlets, blogs, websites, or stages without written permission from Promoter. Any unauthorized use or distribution of the proprietary concepts, materials, and intellectual property by the Attendee or his/her representatives is prohibited and Promoter will pursue legal action and full damages if these terms are violated in order to protect its rights. Children under the age of 18 are not permitted to attend. During our Seminar, we will discuss several adult topics relating to personal and professional growth. We will also occasionally use adult or profane language to emphasize a point or connect with or surprise the audience (though we will never be lewd and we will always use tact and discretion in doing so). The Promoter does not allow anyone under the age of eighteen (18) into the Seminar given the adult topic and content. Participants who are uncomfortable with such topics or language should not attend the Seminar and will not receive a refund should they request one based on an offense to such language under any circumstances. By participating in the Seminar, Attendee understands that portions of the Seminar's live events may be recorded in video and audio and/or captured in still and/or digital photographs. Attendee agrees that the Promoter and its assigns have the right and permission to use such recordings and photographs should they include Attendee's name, likeness, voice, biographical details, testimonial, or photograph for marketing, advertising, or any other purpose in any media or format, online and/or offline, now or hereafter without further compensation, permission, or notification to the Attendee. Attendee understands and agrees that all recordings from the Promoter's events are the exclusive rights of the Promoter and Attendee does not ask for or expect compensation for the use of recordings or photographs in which Attendee appears or speaks. Promoter owns all rights of any audio, video, and/or photograph captured during the Promoter's Seminar or at any of the Promoter's other live events. Attendee is not permitted, under any circumstances, to film, record, or capture audio or video footage during the Seminar. Attendees who violate this may be asked to delete the footage, discontinue the use of the device (such as a recording pen), and/or may be removed from the Seminar without refund. Once Attendee registers for the Seminar, we make extensive arrangements and investments while anticipating their tuition and attendance, and, in the case of their cancellation, we incur significant administration hassles, expenses, and loss of business. Given this fact, we do not accept cancellations or issue refunds beginning 10 days after Attendee has registered for the Seminar. If Attendees cancel within 10 days of registering, they will receive a full refund, but any Attendees seeking to cancel their registration after 10 days will not, under any circumstances, receive a refund. Again, this is due to the extremely limited seating for an event of this nature and with this caliber of celebrity speakers. If you are unsure of whether or not you can attend the event, do not register. If for whatever reason you are unable to attend the event after you have registered and after 10 days have passed since registering, we will happily transfer your ticket to someone else or allow you to attend a future Growth Academy event on the same topic at our sole discretion. Note: The reason we have a cancellation policy like this is because each Seminar sells out and when an Attendee cancels we have to manage the administration challenges as well as gear up the marketing machine to fill the spot. That's why we allow 10 days to cancel, but after that we do not issue refunds. It really does cost us substantial time and resources to process and refund a payment, to refund the promoter or affiliate from which the Attendee signed up, to communicate all this with the Attendee and the promoter and the event planner for the Seminar, and to gear up the marketing machine to fill spots, which includes crafting marketing messages, creating emails, postcards, mailings, etc. Given the number of our Attendees, it's important for us to maintain this policy. This is our only method to ensure that serious participants sign-up and that we do not lose business on empty seats. Attendees can request cancellations or to attend a future event via the correspondence information below. We've taken every effort to ensure we accurately represent this event and its potential to help you grow your business. However, there is no guarantee that you will earn any money using the techniques displayed here, and we do not purport this as a "get rich scheme." Nothing on this page is a promise or guarantee of earnings. Your level of success in attaining similar results is dependent upon a number of factors including your skill, knowledge, ability, dedication, business savvy, and financial situation. Because these factors differ according to individuals, we cannot guarantee your success, income level, or ability to earn revenue. You alone are responsible for your actions and results in life and business. Any forward-looking statements outlined here are simply our expectations or forecasts for future potential, and thus are not guarantees or promises for actual performance. These statements are simply our opinion. No guarantees are made that you will achieve any results from our ideas or models presented at the event, and we offer no professional legal or financial advice. As stated on our Site and in our marketing materials, we guarantee that Attendees will be 100% satisfied with the Seminar should they attend the entire event. Satisfaction is defined as the Attendee’s belief that we have delivered on what we have promised in promoting the event. If Attendees are not satisfied at the conclusion of the event after having attended the entire event, and they notify us in the manner described herein, we will refund their tuition to the Seminar and we may also reimburse their hotel stay and airfare to the event. (The only travel reimbursements that are refundable are a Friday and Saturday night stay at our event Hotel, which the Attendee must have stayed at, and domestic airfare to the event. International airfare will not be reimbursed under any circumstance. All receipts for such expenses must be submitted to Promoter upon request and any travel reimbursements are at the sole discretion of the Promoter). Participants who are not satisfied with the Seminar must, at the immediate conclusion of the Seminar, verbally notify one of our staff members of their dissatisfaction. Unsatisfied Attendees must also turn in all of their course materials as well as their personal notes taken from the seminar. In some cases an Unsatisfied Attendee may be asked to submit a letter explaining their reasons for dissatisfaction as well as their travel receipts if requesting travel reimbursement. Any reimbursements will be made within 30 days of the event. All reimbursements are at the sole discretion of the Promoter and all Promoter decisions are final and binding. Any statements of dissatisfaction or requests for refunds received after 24 hours of the event will not qualify for this guarantee. Note: A guarantee represents a promise about the quality of services delivered; if an attendee never experienced the services (i.e. never attends the entire Seminar), the guarantee obviously does not apply. Further, the guarantee cannot be substituted or confused with the Cancellation Policy, and as stipulated by law and our earnings disclaimer, the guarantee is not based on future revenue or performance. I, the undersigned Attendee, agree to the terms detailed in these Terms of Attendance. All products and services by our company are for educational and informational purposes only. Your level of success in attaining any stated ideas or strategies in our programs or on our websites is dependent upon a number of factors including your health, skill, knowledge, ability, dedication, goals, relationships, love of other humans, and financial situation, to name a few. Because these factors differ according to individuals, we cannot guarantee your specific success or results in any area of life or any endeavor. As stipulated by law, we make no guarantees that you will achieve any specific results from our information, programs or services and we offer no licensed or professional medical, legal, therapeutic, tax, or financial advice in this program. The information contained herein cannot replace or substitute for the services of trained professionals in any field, including, but not limited to, medical, psychological, financial or legal matters. You alone are responsible and accountable for your decisions, actions and results in life, and by your registration here today and use of our programs or websites at any time, you agree not to attempt to hold us liable for any such decisions, actions or results, at any time, under any circumstance. As with any effort in life, there are risks that you may not get ahead - that’s life - so always consult professionals when needed and do what is right for your family. We are simply here trying to help you become more with powerful insights and information. If you ever need anything from us, just reply to any of our emails. We respect your dedication to learning and growing your life, so we're here for you anytime at support@Growth.com.